Not sure exactly when it was, but at some point during the Flyers’ perplexing 1-6 stretch to finish Nov. and start Dec., it became clear that the question wasn’t if coach John Stevens was going to be fired, but when. Coming off a dreadful 3-0 loss to the Canucks on Thursday night and being held scoreless through eight consecutive periods, the shoe has finally dropped on the three-year coach of the Orange and Black. 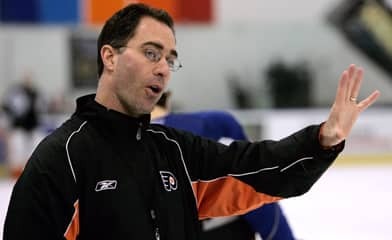 On Friday evening, the Flyers announced that Stevens has been relieved of coaching duties and will be replaced on an interim basis by Craig Berube until a more permanent coach can be acquired. A press conference will be held at 8 P.M. and televised on Comcast SportsNet. Stevens was hired as coach of the Flyers in October of 2006, after Ken Hitchcock was fired due to a poor start to the season. Stevens, who coached the likes of Mike Richards and Jeff Carter to a Calder Cup championship in 2005, was brought in to cultivate the younger talent. However, as the talent got older, Stevens failed to take them to the next level. Despite leading them to the Eastern Conference Finals in 2008, the Flyers have been inconsistent and have been criticized by general manager Paul Holmgren as lifeless. Amid offensive inconsistency the past two games, in which the Flyers have only scored a total of four goals, coach John Stevens has mixed up the lines once again in an attempt to capture some depth production. One day before the Flyers travel to Florida for a five-day team building trip, Flyers’ coach John Stevens explains his thoughts on the team’s heartbreaking 3-2 shootout loss to Anaheim on Saturday. Teemu Selanne scored two third-period goals, including one to tie the game with 16-seconds remaining. Despite back-to-back losses, the Flyers have earned seven of a possible 10 points in the first five games of the season. A big change over the team’s 0-3-3 record after the first six games of the 2008-09 season. The Flyers will be back in action on Oct. 16 against the Florida Panthers. It may not have been a real game, but it was the closest thing so far. The Flyers held two intra-squad scrimmages on Tuesday at the Skate Zone in Voorhees, N.J., one being dominated by Jeff Carter and the other Ray Emery. VOORHEES — With all but one forward roster spot filled for the 2009-10 season, the biggest question for the Flyers becomes … who is with who? The Flyers open training camp on Sept. 13 at the Skate Zone in Voorhees, N.J. And although the team is primarily keeping the same line chemistry as last season, there will be some changes. VOORHEES — For those who assumed that Blair Betts’ training camp try out would automatically end in a roster spot – think again. On his first day of skating at the Flyers’ practice facility at the Skate Zone in Voorhees, N.J., Betts didn’t seem confident that he was a shoe-in on the Flyers’ roster. “We have been talking to the Flyers for a couple months and there seems to be a little bit of interest from them,” said Betts, who spent the last four years with the Rangers. “There is an opportunity (to earn a contract) but I don’t know how great of an opportunity it is. Former Buffalo first-round pick Jiri Novotny, considered Philadelphia his last shot at staying in the NHL. But the deal wasn’t to be. According to Swiss league magazine Slapshot, Novotny has failed to come to terms with the Flyers and has secured a verbal deal with Swiss team Geneva-Servette. However, something may come in the way of Novotny and the Swiss league, which could land the player in the KHL. Flyers’ coach John Stevens made it clear on Monday, that he plans for Claude Giroux to remain at center. A decision that could have been solidified by the failure to come to terms with Novotny.